Meticulously crafted design, timeless, chic, and modern, and ALSO reliable. 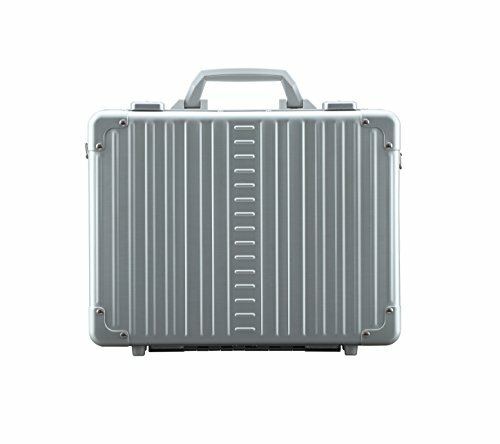 This hard body case is made of Aircraft grade aluminum, extremely durable and lightweight at the same time. The solid Aluminum frame is secured with riveted construction and reinforced corners for extra strength. The sturdy square corners give this case a modern look and allows for generous interior space. Two resettable TSA approved locks, accepted as the standard all over the world. These dependable locks make sure your business affairs stay safe and secure. Inside - this case is fitted with a seamless rubber seal to ensure that the case is both airtight and water resistant. ALL Business – and First Class indeed, built to handle tough climates and extreme temperatures – and built to keep out moisture and grime. Aleon’s lining is made of 70 Denier Nylon with a Polyurethane Coating, stain resistant, water repellant, and nonabrasive so it won’t harm your confidentials. This Complete Business organizer has two pen pockets, two additional accessory pockets, a roomy padded tablet pocket, and can easily accommodate a laptop up to 15". The two interior – heavy duty straps ensure your items are kept in place. The attache also comes with a sturdy shoulder strap and an over the handle belt to secure it to your other rolling luggage for those lengthy airport transfers. Aleon is proud to facilitate in-house production, responsible for all the manufactured elements of these high-end luggage pieces —excluding the TSA locks—we can keep our cost down and give the savings back to you, our customers. The attache case comes in Platinum and Sapphire. Each case also comes with a protective storage cover for safe keeping. If you have any questions about this product by ALEON, contact us by completing and submitting the form below. If you are looking for a specif part number, please include it with your message.